Happy October from Go Global! The blog’s focus in September was to get you acquainted with each of our programs, our locations, and our interns. Now, application season has begun! That’s right… yesterday was our application launch for Summer 2015! If you haven’t already applied, you can find the link here. And if you have…or, if you’re waiting until you learn some more information about the nuts and bolts… October’s blog focus will be to make sure all of your financial questions are answered. Of course, all of this information can be found here on our website, and our staff is readily available to answer your questions when contacted, but why not have another forum to display this information for you? We understand how important it is to plan out the possibilities of ways to afford this amazing opportunity for your child. So, you can look for a post on the blog every Tuesday in October in a “Financing Study Abroad” multi-part series. Today’s post? Go Global Total Costs. Let’s break it down program by program. Disclaimer: The cost of flights will be different based upon when the flight is purchased, where the flight is coming from, and whether or not you choose to come with us on the group flight. These numbers are guesses based on research of what is available at this time. Also, personal spending money will vary drastically from student to student based on his or her personal budget that is decided with his or her family. These numbers are averages. Cape Town Direct has a program fee of $2700. In addition, you will need to budget for your flight and spending money abroad. We recommend setting up a flight alert with Kayak or Cheaptickets so that you can find the best deal on your flight! On the ground, your spending money will go for some meals. souvenirs, taxis, and free time activities. We recommend you chat with your parents to determine what is reasonable for your family! Greece Direct has a program fee of $2900. Assuming your flight costs the same as Cape Town Direct and you spent the same amount of spending money, your Greece Direct trip, in total, could be a similar cost to the Cape Town Direct trip. Cape Town LEAD has a program fee of $4950 and an additional tuition cost of $3000. Because this trip is 5 weeks compared to the Direct trip of 2 weeks, this trip will require more spending money, but flight costs should be about the same. Greece LEAD has a program fee of $5150 and an additional tuition cost of $3000. The amount of spending money on this trip, as all of the others, will depend on what you choose to participate in in terms of free time activities and meals. GO: Rome has a program fee of $3650 and an addition tuition cost of $3000. In addition to the flight cost, it is important to decide whether or not you will be hopping from country to country or city to city while on GO: Rome (You don’t have to, by the way!). If so, include an estimate of additional transportation fees, such as flights and trains, from place to place in your spending money budget. -Your spending money will vary so much based on what you would like to do that is not covered in the cost of the program fee. For a list of what is included and not included in the program fee, check out the websites at the links above. 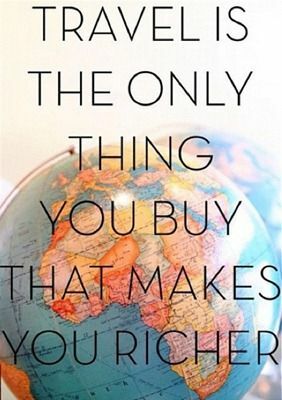 Some things our students will spend their personal spending money on: meals, cabs, plane tickets or train tickets from country to country or city to city, optional adventures such as skydiving, paragliding, sandboarding, or boating (to name a few), souvenirs, wine tours, grocery shopping, or nights out on the town. -The information regarding the group flight will be posted at a later date, as soon as possible. Go Global works hard to find the best deal for our students to save money and also to provide convenience and comfort in flying together. -Go Global does offer a scholarship. In a future post, we will provide information about external scholarships, but for now, let me familiarize you with ours. Go Global offers a $500 scholarship that goes toward your program fee. You are able to apply for this scholarship once you have applied, paid your $500 deposit, and been accepted. There is no set amount of students who will or will not receive the scholarship; it varies. Completion of the scholarship application requires answering essay questions. -Any and ALL of your financial questions go to Beth Ann Schroder, who can be emailed at bethann@goglobalexperiences.com. Please reach out to her to discuss any of the financial aspects about studying abroad. Next week … be on the look out for a post about external scholarships! For now, we hope you have a better grasp on what each of our programs will cost in total and what is covered in that cost. « Quiz: Which Program is Right for me?